Sol Kerzner, resort entrepreneur, created a beautiful themed resort that features the lost city of Atlantis. StonePly was able to fabricate, deliver, and install over 144,000 square feet of custom exterior natural stone panels in The Cove Atlantis and The Reef Atlantis. These panels feature custom sawn and bush hammered textures to give the cladding depth and beauty. 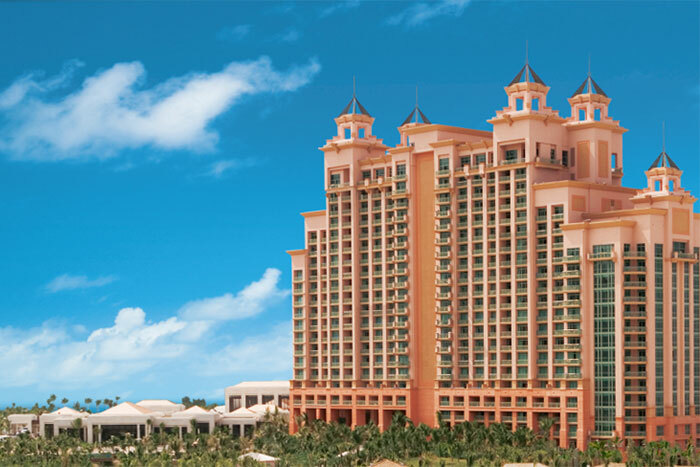 Part of the reason for selecting StonePly for The Cove Atlantis was the success of the earlier cladding we supplied for Atlantis which survived numerous hurricanes, including one of which was a category 5, and has survived with minimal to no damage. The customer needed a cladding that could both be used on the exterior and interior of the building, that matched the beauty of the resort, and added a high class feel to the resort. They were looking for a cladding that was easy to install, blended with the tropical feel of the resort, and minimized the disruption of the existing resort. The biggest challenge was to find a cladding that was impact resistant due to the weather that is inherent to the country. StonePly was able to provide an impact resistant cladding that met the Miami requirements of hurricane resistance. The travertine was bonded to an aluminum honeycomb panel and attached using both Z-Clip extrusions and concealed screw attachments. All the attachments were attached in the field using #10 stainless steel TEK screws. Installation was completed on time and on budget by our qualified installation team.